Overall, four-in-ten Latinos say they have experienced discrimination in the past year, such as being criticized for speaking Spanish or being told to go back to their home country. These experiences are more likely among those who say others see them as Latino, black or another non-white group than among Latinos who say others see them as white. At the same time, just as many Latinos say someone in the past year had expressed support for them because they are Latino. About two-thirds of U.S. Hispanics (68%) say that if people passed them on the street they would describe them as Hispanic or Latino. Hispanics who are foreign born (79%) and second generation (68%) are more likely than the third or higher generation (50%) to say this. Meanwhile, about one-in-five Hispanics (18%) say people passing them on the street would describe them as white. This share increases as immigrant connections grow distant. 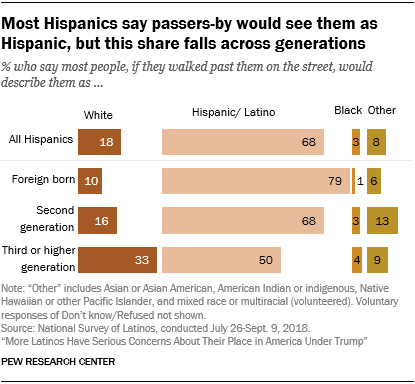 About 10% of Hispanic immigrants say a person would describe them as white, while 16% of the second generation and 33% of the third or higher generation say the same. Many Hispanics with lower levels of education also say those passing them on the street would see them as Hispanic or Latino. About three-quarters of Hispanics with a high school diploma or less (77%) say this, compared with 56% of those with some college education or higher. By contrast, about a quarter of Hispanics with some college education or higher (27%) say people passing them on the street would describe them as white, compared with 12% of those with a high school education or less. Nearly four-in-10 Latinos (37%) say that during the past 12 months, someone has expressed support for them because they are Hispanic or Latino. Yet about the same share (38%) also say they have recently experienced one of four incidents – being called offensive names, being told to go back to their home country, being criticized for speaking Spanish in public, or experiencing discrimination or unfair treatment because they are Hispanic. 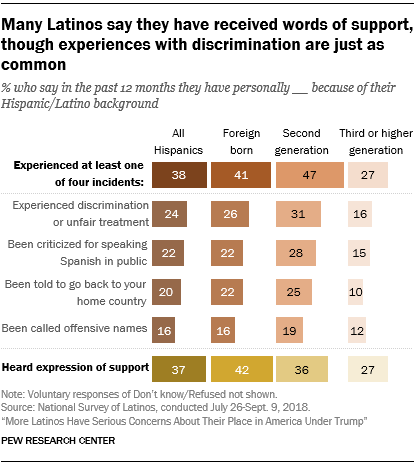 Overall, about a quarter of Latinos (24%) say someone has discriminated against them or treated them unfairly because of their background, while 22% say someone has criticized them for speaking Spanish in public. About 20% say they have been told to go back to their home country, and about 16% say they have been called offensive names. Hispanic immigrants and second-generation Hispanics (those born in the U.S. to at least one immigrant parent) report more often than third or higher generation Hispanics being subjected to three of the four incidents asked about in the survey – being criticized for speaking Spanish, being told to go back to their home country and experiencing discrimination or unfair treatment. The share of Latinos who say they have received an expression of support over the past year is higher among Spanish-dominant (44%) and bilingual speakers (39%) than among English-dominant speakers (27%). The bilingual and Spanish dominant also reported more discrimination. About a quarter of Latinos who are bilingual (28%) and Spanish dominant (25%) say they have experienced discrimination or been treated unfairly, compared with 19% of English-dominant Latinos. For Hispanics, the way the world views their race or ethnicity is linked to how often people express support for them and how often they experience discrimination. Latinos who say people walking past them on the street would see them as Hispanic or Latino or as black are more likely to say someone expressed support for them in the past year because they are Latino. Those who say others see them as white are less likely to say this has happened. A similar pattern is true when it comes to experiencing discrimination: Those who say others see them as white are less likely than other groups of Latinos to report experiencing one of the four incidents asked about in the survey. Differences also exist by party affiliation among Hispanics – more Democrats (43%) than Republicans (24%) say they have experienced at least one of the four incidents.